In the world of high gas prices and tough gas mileage standards, even exotic supercar manufacturers are having to think about ways to make their cars leaner, meaner, and greener. Which is why one exhibit on the Ferrari stand at the 2012 Paris Auto Show--the carbon fibre tub which will form the basis for an as-yet unnamed hybrid electric supercar to succeed the Ferrari Enzo--attracted almost as much attention as the finished cars it was displayed alongside. 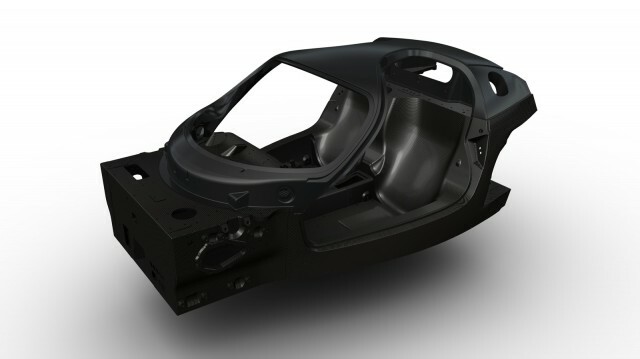 As MotorAuthority reports, four different types of carbon fiber are used in the construction of the tub. Each layer is hand-laminated before being cured in an autoclave. Ferrari has said the techniques used to build its new hybrid supercar come directly from the world of Formula One racing, rather than the resin transfer moulding process normally used in automotive carbon fibre applications. The result is a combined chassis and tub which is 20-percent lighter than the chassis used on the Ferrari Enzo. It also has increased torsional rigidity of 27-percent, and an increase in beam stiffness of 22-percent. The lighter, newer chassis isn’t the only improvement made by Ferrari to help gas mileage. The hybrid system, called HY-KERS by Ferrari, is surprisingly light too. Sources at Ferrari quote the weight of the electric motor--situated between the seven speed, dual-clutch gearbox and the rear wheels--at a lightweight 110 pounds. The battery pack, made by Samsung Electronics at its F1 racing headquarters, will weigh in at 220 pounds. At present, Ferrari hasn’t detailed how large it will be, or how powerful the motor will be. But there is one given: the new car, which sources say will be called the F70, will also feature a normally aspirated V-12 gasoline engine. Combined, the car is expected to produce 900 horsepower. The gas mileage remains a closely guarded secret.